In a unanimous vote yesterday, Anthony R. Foxx was confirmed by the Senate to serve as the next U.S. Department of Transportation Secretary. 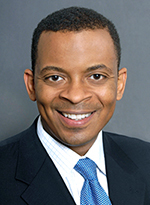 Serving as Mayor of Charlotte, N.C. since 2009, Foxx helped lead the way on several transportation initiatives in the city, including a streetcar project, expansion of the airport and extension of a light-rail line. He will replace outgoing Secretary Ray LaHood. Registration opens Monday, July 1 for California’s largest one-day transportation conference and expo on Tuesday, Oct. 29 at the JW Marriott at L.A. Live. 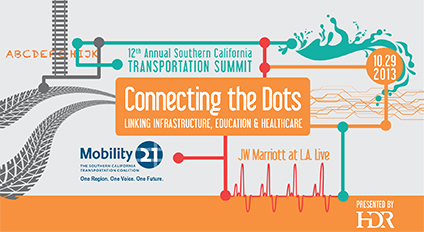 “Connecting the Dots: Linking Infrastructure, Education & Healthcare,” the theme of this year’s Southern California Transportation Summit, promises to bring together more than 1,000 transportation stakeholders, industry leaders, elected officials and community activists. This year’s Summit will expand the dialogue beyond traditional stakeholders by focusing on the vital connections between transportation, water, energy, education and healthcare. Summit planning continues to move ahead at full-speed and we’re working hard to develop innovative breakout sessions, thought-provoking plenary sessions and unique networking opportunities. Registration includes access to top industry decision-makers and elected leaders, three general sessions, a choice of eight breakout sessions and a dynamic expo hall with over 100 exhibitors. General registration also includes a breakfast buffet, hot lunch, complimentary self-parking or Metrolink pass/Metro TAP card. Start following Mobility 21 on Twitter and Facebook for an exclusive registration discount code available to the first 25 registrants! Discount hotel rates are available to conference attendees! Click here to reserve your room now. Space is limited and the discount is only available until it’s sold out or Thursday, Oct. 10. Are you still thinking about sponsoring the Summit? It’s not too late! Help support Southern California’s transportation future while getting the best access, visibility and value for your marketing dollar. Click here to view the sponsorship packages or contact Marnie O’Brien Primmer to sign up today. This month we talked with the new CEO of the Transportation Corridor Agencies (TCA), Neil Peterson, to learn more about his goals and priorities for the agency. Please join us in welcoming him to TCA! M21: Your background contains diverse and innovative accomplishments. Share with us how your experiences will help TCA in your new role. NP: I hope that my more than four decades of leadership experience in the public, private and nonprofit sectors will benefit TCA. I know, both, the public and private side of the transportation industry well and can use that knowledge to lead the agencies forward with the major initiatives of converting to all electronic tolling and finding an alternative route to the highly congested Interstate 5. M21: What are your overall goals for TCA? NP: More than anything, I want to show the public the energy and strength of this agency. We are a leader in the tolling industry, we innovate everyday and we aren’t afraid of challenges. I want the public and the community to see that and feel that. I want drivers to have the choice of using our express lanes. M21: What are the challenges and opportunities for the top priorities of TCA – prudent fiscal management of the toll roads and the extension of the toll lane network? 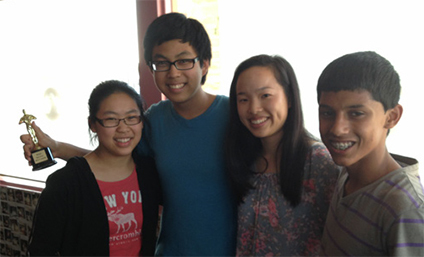 NP: I am joining TCA at an exciting time when many new opportunities are on the horizon. The State Route 241 Tesoro Extension is a project that will extend the southernmost section of the 241 Toll Road by 5.5 miles, accommodating the surrounding area already under development with 14,000 new homes being constructed and more than 5 million square feet of commercial space planned. Additionally, TCA will soon be switching to all electronic tolling, eliminating the need to stop and pay at toll booths and giving all users of the Toll Roads the experience of non-stop driving and more time savings. I can’t wait to lead our team to meet those – and any other – challenges. M21: How will you work with partner agencies and coalitions as well as potential decision-makers to ensure the long-term viability of the toll roads in the overall transportation network for Southern California? NP: While The Toll Roads represent 21 percent of the highways in Orange County, our four toll roads are a regional lifeline for those in Los Angeles, the Inland Empire and San Diego who commute daily to and from work. I look forward to engaging the various regional transportation agencies to address infrastructure deficiencies and opportunities to collaborate to reduce congestion, increase mobility and help the job economy. With the paucity of state and federal financial resources, we need to work together to explore all avenues to find the financial resources needed to meet our transportation infrastructure needs. The Toll Roads are one way of introducing the market mechanism into the transportation sector. M21: Tell us what most don’t know about you. NP: I am the proud founder of the Edge Foundation, a non-profit that gives students who are non-traditional learners with executive functioning challenges, such as ADHD, a coach to help them complete their education, realize their full potential and pursue their passion. Members of the Congressional panel on 21st Century Freight Transportation visited Southern California last month to hear from Mobility 21 Executive Director Marnie O’Brien Primmer, Southern California Association of Governments Executive Director Hasan Ikhrata and other regional leaders on suggestions to improve freight movement. On May 30, Mobility 21 Executive Director Marnie O’Brien Primmer joined Southern California Association of Governments Executive Director and Mobility 21 Board Member Hasan Ikhrata to testify before the U.S. House Transportation and Infrastructure (T&I) Committee Panel focused on how the region’s unique transportation challenges impact the movement of freight throughout the entire nation and the importance of greater freight efficiency to the U.S. economy. Congressional members in attendance at the hearing in San Bernardino included Chairman of the Panel John J. Duncan (TN-2), Corrine Brown (FL-5), Janice Hahn (CA-44), Richard Hanna (NY-22), Daniel Lipinski (IL-3), Gary Miller (CA-31), Markwayne Mullin (OK-2), Jerrold Nadler (NY-10), Grace Napolitano (CA-32) and Albio Sires (NJ-8). Southern California representatives Hahn, Napolitano and Miller know first-hand the challenges Southern California faces and the impact freight movement in the region has on the nation’s economy. Representing the San Gabriel Valley in Los Angeles County, Congresswoman Napolitano has championed efforts to improve freight movement in Southern California. “While we improve freight movement, we must also mitigate the negative impacts that freight has on local communities by building highway-rail underpasses, reducing mobile source air pollution and improving safety in goods movement corridors,” said Congresswoman Napolitano. 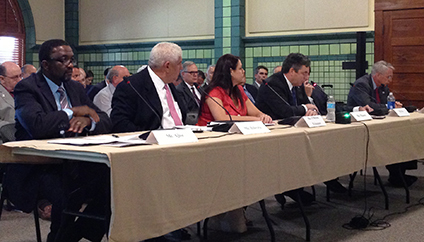 Testimony included specific recommendations for the improvement of U.S. freight transportation. Witnesses focused on Southern California’s importance to the national economy as America’s trade gateway and discussed potential funding sources for a dedicated federal freight funding program in the reauthorization of MAP-21. The Committee also received testimony from Kome Ajise, Deputy Director for Planning and Modal Programs for the California Department of Transportation; Scott Moore, Vice President for Public Affairs of Union Pacific; Mike Fox, President and CEO of Fox Transportation; and Rick Richmond, former Chief Executive Officer of the Alameda Corridor-East Construction Authority. Mobility 21 honored Senate President pro Tem Darrell Steinberg, Senator Mark DeSaulnier, Senator Bill Emmerson and Assemblymember Bonnie Lowenthal in Sacramento earlier this month. 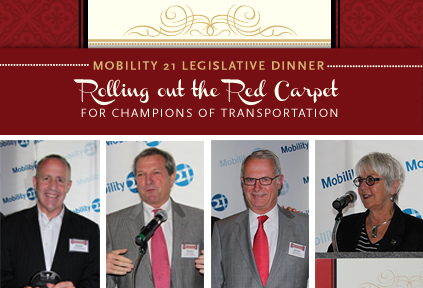 More than 100 transportation professionals, business leaders and elected officials gathered on June 11 for Mobility 21’s first-ever legislative dinner in Sacramento, “Rolling out the Red Carpet for Champions of Transportation.” Mobility 21 honored Senate President pro Tem Darrell Steinberg, Senator Mark DeSaulnier, Senator Bill Emmerson and Assemblymember Bonnie Lowenthal for their leadership on transportation issues. This year, Senate President pro Tem Darrell Steinberg has worked tirelessly to make meaningful reforms to the California Environmental Equality Act to eliminate the abuse of California’s environmental laws. During his remarks at the event, he also championed self-help county initiatives to invest in transportation. As Chair of the Transportation and Housing Committee, Senator Mark DeSaulnier has championed transportation issues to ensure the greatest return on the state’s infrastructure investment. This year, Chair of the Assembly Transportation Committee Bonnie Lowenthal authored Assembly Bill 574, which would establish a regional competitive grant program for cap and trade revenue for projects that combine transportation investments with local land use changes. She also is a strong advocate for freight movement investment and was recently chosen to serve on the Department of Transportation’s National Freight Advisory Committee. “Moving forward with goods movement projects is so important to California. As a member of the National Freight Advisory Committee, I plan to go to Washington to make sure our region receives needed investments to improve our freight network,” said Assemblymember Lowenthal. 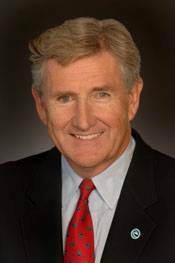 Senator Bill Emmerson’s leadership has helped secure design-build and public-private partnership authorization, helping Southern California deliver much-needed transportation projects sooner. Award winners unable to attend included Governor Jerry Brown, Senator Alex Padilla, Speaker of the Assembly John Pérez and Congressman Juan Vargas. Click here to view photos from the event. Parsons Brinckerhoff has helped to design and build infrastructure in Southern California for 40 years. As part of the fabric of the communities in which Parsons Brinckerhoff works, the company serves and partners with its clients in the development of effective transportation services throughout the region. Parsons Brinckerhoff strongly supports the advocacy and coalition-building efforts of Mobility 21 and proudly supports the 2013 Mobility 21 Summit for the sixth year. As sustainable practices become more necessary in the development of transportation infrastructure, so does the commitment of firms providing these services. Parsons Brinckerhoff employs sustainable practices, both in the industry and in its offices. The company was built on the nation’s early transit projects that continue to sustain many of the largest cities in New York, Atlanta and San Francisco. Likewise, Parsons Brinckerhoff is bringing its expertise to the more recent challenges in climate change and sustainability. Parsons Brinckerhoff has integrated sustainability into the company’s core values, the way it operates and the way it develops solutions for clients. Parsons Brinckerhoff inspires the world’s best teams to create innovative solutions for physical assets that enhance communities for future generations. Metro, Metrolink and 10 municipal transit agencies joined forces this month to demonstrate new latching entrance gates at the Metro Red and Purple Lines at Union Station. 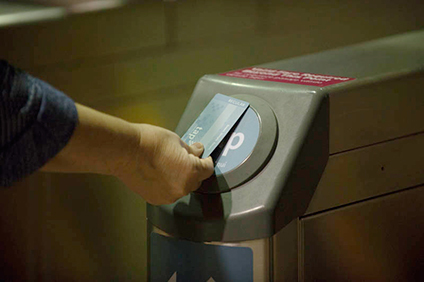 The new latching gates will be phased in during the next six months, which will require all Metro riders to have a TAP card. TAP also can be used on Metro’s 2,000 buses and those operated by municipal bus systems such as Los Angeles Department of Transportation, Torrance, Foothill and Antelope Valley. Today there are 10 transit carriers integrated in the TAP program. Within a year, there will be 25. TAP allows any rider with a TAP card to transfer seamlessly to another carrier without having to fumble for change or figure out what a particular carrier charges. Click here to learn more. On June 7, the Long Beach Board of Harbor Commissioners announced the appointment of Al Moro, Chief Harbor Engineer, as the Port of Long Beach’s Interim Executive Director. Moro, who joined the Port in 1997 as a civil engineer, currently oversees all administrative and technical activities for the Port’s engineering programs, including nearly $4 billion in capital improvement projects. The entire Board of Harbor Commissioners also named Dr. Noel Hacegaba as Interim Deputy Executive Director of the Port. Hacegaba will be working closely with Moro and the rest of the senior management team to guide the Port through the projects and initiatives that are underway. As part of a service project, the Ventura County Transportation Commission’s Teen Council created a video about using public transportation. One year ago, the Ventura County Transportation Commission (VCTC) Teen Council released its Student Rider Guide. The informational brochure geared toward teens was not only distributed to schools and facilities across the county, it earned a national award from the American Public Transportation Association. At the June 7 VCTC meeting in Camarillo, the Teen Council unveiled its latest project – an informational public service announcement focused on teens’ perception of public transit. VCTC’s Teen Council, comprised of teens from across Ventura County, meets monthly throughout the school year to raise awareness of transportation, air quality and other community-wide issues. The group created the video to promote bus ridership as an affordable transportation option that increases teens’ independence, lessens traffic congestion and benefits the environment. Click here to check out the video online. 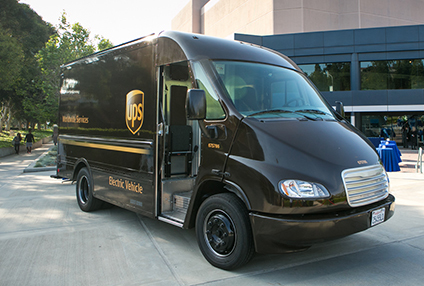 This year UPS has continued to grow its alternative vehicle fleet with plans to purchase approximately 700 liquefied natural gas (LNG) vehicles and to build four refueling stations by the end of 2014. Once completed, the LNG private fleet will be one of the most extensive in the U.S.
UPS has been operating natural gas vehicles for more than a decade. With natural gas prices 30-40 percent lower than imported petroleum, the logistics company is investing more aggressively in the natural gas infrastructure necessary to make it part of the UPS delivery network here. Worldwide UPS has more than 1,000 natural gas vehicles on the road today. UPS’s alternative fuel and advanced technology fleet of more than 2,600 vehicles also includes a wide array of low-emissions vehicles, including all-electrics, electric hybrids, hydraulic hybrids, propane, compressed natural gas and biomethane. Since 2000, the fleet has driven more than 295 million miles.